Tiltable and telescopic steering wheel. Volkswagen New Polo, the premium hatchback from the house of Volkswagen, is finally here in India. The New Polo launched in India belongs to the Fifth generation of the Polo models and has a huge fan following throughout the globe. Volkswagen New Polo won the "European Car of the Year" for the year 2009 with flying colours. The first generation of New Polo made its global entry during the year 1975. A hatchback with a perfect blend of elegant style, stout quality and exciting engines, the Polo has been designed keeping the Indian driving conditions in mind. After having launched the Jetta, Passat, the iconic New Beetle and the Touareg, Volkswagen India is trying to reach out to the masses with its compact hatchback Polo which has been priced competitively. Volkswagen New Polo will be available in range of colours like that of Reflex Silver, Emotion Blue, and Pepper Grey, Candy White, Deep Black and Flash Red. The Polo will also come with both petrol and diesel engine options. The New Polo will establish a leadership position in its class with category defining attributes of space, style, comfort, safety and fuel efficiency. It is manufactured at Volkswagen's state of the art Chakan plant with an annual capacity of 110,000 cars. The Volkswagen New polo comes in both Petrol and diesel versions. The petrol variant is equipped with a 1.2 litre engine which produces an output of 74 bhp @ 5400 rpm and a Torque of 110NM @ 3750 rpm. The diesel variant is also equipped with the 1.2 litre engine with an output of 75HP @ 4200 rpm and torque of 180 NM @ 2000 rpm. The VW Polo which comes in three variants Highline, Comfortline and Trendline. A 1.6L Highline Variant of the polo is also in the offing. Both the engine types feature 3-cylinders and can generate a displacement of 1198cc. The 5-speed manual gearbox transmits power with short and accurate shifts, making it amazingly easy to use at the right engine speed. The 1.2l petrol can zoom from 0-100kmph in 14.2 seconds and the 1.2l diesel can do the same in 14.4 seconds. The New Polo can be best described as a young sizzling-hot flashy car. It has been brilliantly engineered borrowing designs from the Tiguan and Golf car. The hatchback proudly exhibits a galvanized body with coloured bumpers and halogen headlights. The New Polo's tank-like body is impressive too. It is a true leader in the hatchback segment when it comes to space, style, comfort, safety and fuel efficiency. The exteriors are backed by a 6-year anti-corrosion warranty. 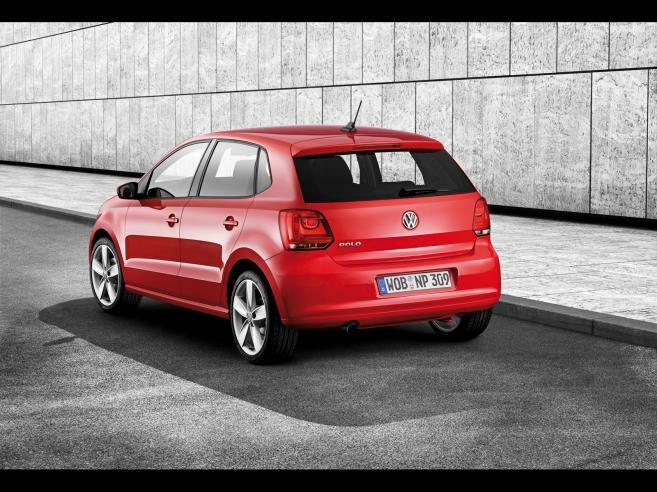 The new Polo embraces chrome trims and hefty 15" alloy wheels safe in their flared arches demanding a second look. The New Polo's beauty and performance is enhanced with fog lamps and a rear wipe with defogger. The interiors are sufficiently spacious with storage compartments in the front door. This door can easily accommodate a 1.5L bottle. The New Polo also has space for sunglass storage inside the glove box. Unlike most luxury sedans in India, all open windows of the Polo can be closed by just a single touch of the remote. The tilt and telescopic power steering eases out the strain on the driver during a tiresome journey. The height of the driver seat can be comfortably adjusted ensuring better visibility. Folding rear seat backrests and the two-tone dashboard are classic features too. The simply amazing fabric upholstery of the New Polo is matchless. The super-mini hatchback allows keyless entry with remote opening and has a multifunctional display. 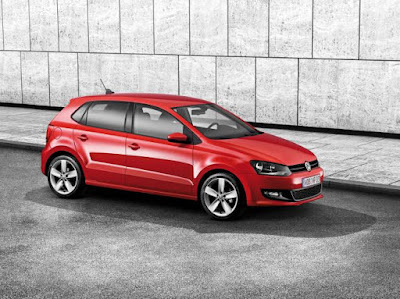 The Volkswagen New Polo is all-ready with advanced occupant safety with an electronic anti-theft immobilizer. In addition to the strong wheels, it also has an Anti-Lock Braking System and airbags for the driver and passengers. The central locking system of the New Polo with a unique boot opener in company logo is noteworthy. For entertainment, the new car houses a CD MP3 Player changer with 4 speakers. The green-tinted sun-blocking glass is one of a kind in the Indian car industry.